One thing that I missed badly when I moved from Michigan, other than friends, was the Lebanese food. For those who has never tried it, Lebanese food is mild and flavorful without being hot. It is dry–no sauces or gravies–with lentils, and kebabs and meats akin to dry barbecue. It is subtly spicy and filling and perfectly portable–as in pita wrapped sandwiches. In addition to mom & pop restaurants, there was a chain restaurant which served excellent Lebanese food (yes, chain restaurant! ), well at least in my opinion. I must have tried most of their menu (where raw meat was not included) but my all time favorites to this day are Chicken Shawarma (equivalent to grilled chicken pita wrap) and Majadra (lentils and bulgur wheat, eaten with pita bread and yogurt). I have seen many variations in spelling ranging from Mjadra to Mujaddara. I believe it depends on the region and whether rice or wheat is used. For a trove of info on this look up Wikipedia. As I no longer has access to that wonderful food, I attempted making it at home. But my research on Google, most food blogs, cookbooks gave me the version with lentils and rice. There were a few with bulgur, but did not seem to yield the end product I had in mind. So I tried to figure out what must have been used to achieve that flavor balance. Garlic and Cumin for sure, maybe black pepper or red pepper for heat? I tweaked this combination, adding some and taking away some. All of which passed the taste test of my guinea pig (aka husband). But the best I liked and which was very close to the restaurant kind was with Garlic, Cumin, Salt and a pinch of Red Pepper flakes. * I used a couple of tea bags in the water to cook lentils and bulgur to get a rich brown color. ** You may want to make a bigger batch as they take a while to caramelize. You can use them in so many ways….Omlette topped with caramelized onions, anyone? Slice the onions and spread them in a wide pan heated on medium-high with 2-3 tbsp oil. Once the onions start turning golden at the edges, bring the heat down to medium low and toss to spread the caramelization. Add a pinch of sugar to aid the caramelization process and cook of low for 15-20 minutes, until the onions are soft and uniformly brown. Meanwhile in a large enough pot, add 3 cups of water and enough salt so that it tastes like sea water. Once boiling add a tea bag, and the soaked lentils. On medium heat boil the lentils for 20 minutes or so until tender but not mushy. Remove the tea bag and drain excess water. While lentils are cooking, bring 1 cup water to boil in another pot with a pinch of salt. Once boiling add a tea bag and infuse the color. Remove the tea bag and add a tablespoon of oil and bulgur. Bring the heat down to medium and let simmer, covered, until all water is absorbed, about 10-12 minutes. When done bulgur should be soft but a bit chewy. If any excess water is present at this stage, strain and spread it on a wide plate, drizzle a tablespoon of oil and fluff with a fork. The goal is to allow the bulgur to stay separate and not clump up. In a wide non-stick skillet, add about 4 tbsp oil and heat on medium. When hot, grate the garlic clove directly into the oil and saute until fragrant. Add the cumin powder and black pepper powder and red pepper flakes and lightly fry for a couple of minutes. Now add the bulgur and let it saute for 4-5 minutes or until the aromatics incorporate with bulgur and it turns lightly darker. At this stage add the cooked lentils, and fold carefully avoiding clumps. 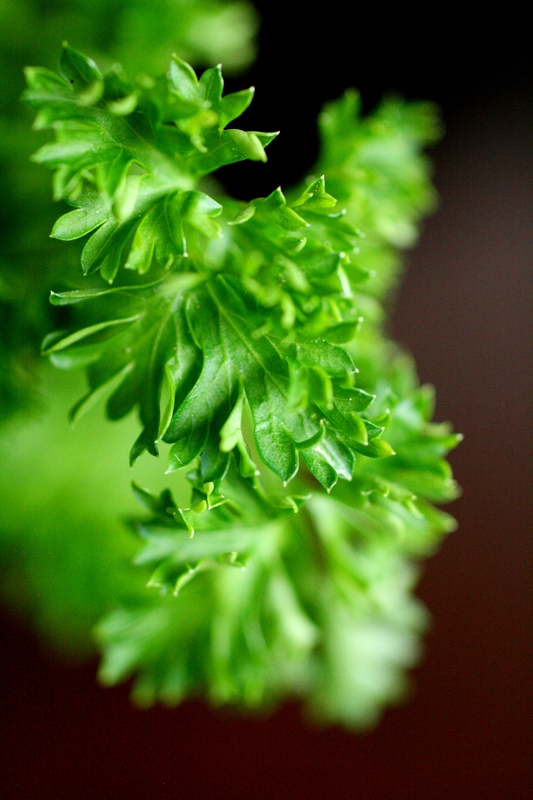 Top it with generous amounts of caramelized onions and garnish with parsley. Eat with beaten yogurt sprinkled with Sumac or Paprika. 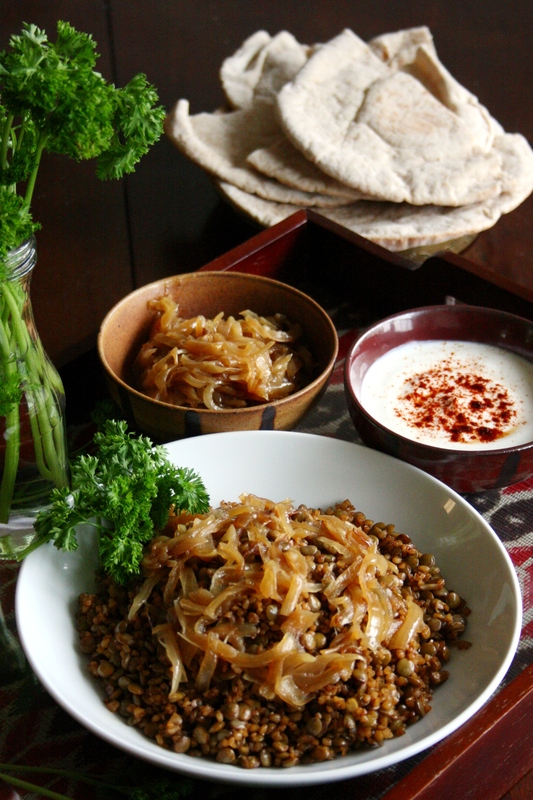 Best served with warm Pita bread–Cut the pita into half and fill the pocket with Majadra. Drizzle yogurt and top it with caramelized onions and parsley. This entry was posted in International, Recipes, Vegetarian. Bookmark the permalink. At least you have an idea of what you want so you can create something similar. This does look really delicious. I think lentils are amazing. Your photos are beautiful as always. 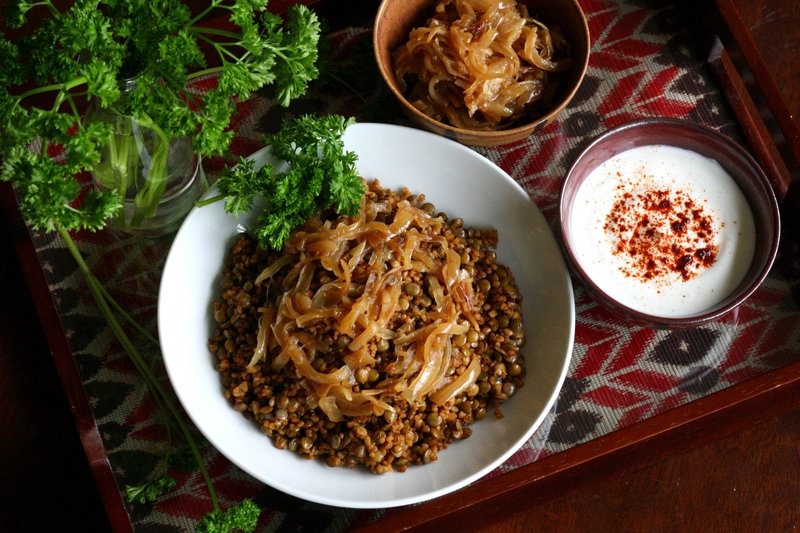 I so love lentils and caramelized onions and all these additions are just icing on the cake! So true…i can just eat this for the onions! Gorgeous photographs! This dish sounds lovely; I adore bulghur wheat and it sounds like a wonderful, sweet-salty-savory dish (lovely with the yoghurt, I’m sure!). Thanks, Susan. If you like bulgur..this will not disappoint you. This looks so dang good! I’ve never cooked with bulgar but I think this will be the recipe that convinces me to try it. You should definitely try, I am sure you will love it. This was amazing, tastes just like the majadra I’ve had in Lebanese restaurants in Detroit, thanks for sharing! Great recipe! Tastes just like the majadra I remember eating at Lebanese restaurants in Detroit! Thanks for sharing! Yes!! Surprisingly majadra elsewhere never tastes the same as in Detroit. My Lebanese mother always added a little mixed spice – a mixture of ground allspice, nutmeg and cinnamon – to savory dishes. In my “taste memory”, this creates the distinctive Lebanese taste. This is contrary to our western notion that these spices only go with sweet dishes.